What would you do if someone came into your house and told you it wasn’t yours, and then demolished it right in front of you? And what would you do if someone built a fence on your land, and then uprooted your cherished olive trees right in front of you? Would you say “whatever ,” or would you put your body on the line? The residents of the beautiful hilltop West Bank near Ramallah village of Budrus – population 1400 – do just that in Palestinian director Julia Bacha’s award-winning new documentary which sheds much needed light on the daily plight of her continuously demonized people. “Palestine is still the issue,” as British writer and documentarian John Pilger always says, but Bacha and company don’t treat this as a concept but as a living, breathing visceral thing. Budrus lost most of its land to Israel in the ’48 war – and so what remains is doubly precious. The village’s struggle is against The Separation Barrier — the Security Fence, Apartheid Wall, call it what you will – which has been strangling what remains of historic Palestine since not long after the beginning of the Second Intifada in 2000, and which the armed to the teeth IDF (Israeli Defense Forces) are there to make an unalterable fact on the ground. Budrus’ dynamic leader Ayed Morrar, who has been imprisoned – virtually everyone in Palestine knows someone who’s been thrown into jail, usually in their own family, often for multiple sentences lasting many years – and his equally passionate and charming 15-year-old daughter Itezam. 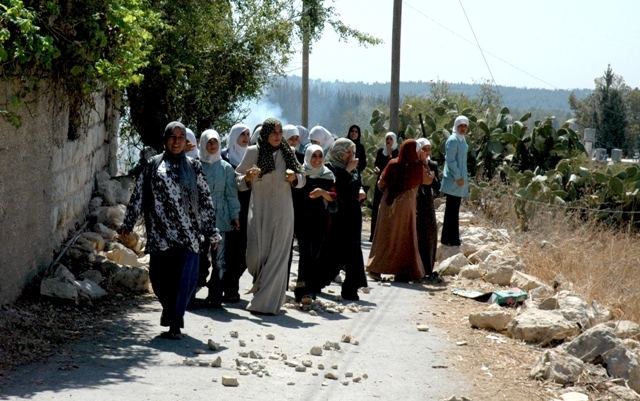 Their weekly after Friday prayers protests show the entire village, the women in front, plus many Israelis and internationals, putting their bodies on the line. Itezam jumps into a hole dug by a bulldozer, young boys replant an olive tree severed from its earth, while the IDF invades the village’s sloping streets with next to each other houses, its people scared to death. It’s hard for us way too mobile Americans to bond, much less identify, with people who hold their land and its history in the palm of their hand, but Budrus somehow makes us care. How? By places, and extraordinary faces. Film is, after all, first and foremost a language of images, and Bacha’s, culled from many on the ground and borrowed news clip sources, have been skillfully edited – few directors, save the way underrated George Stevens, can make shot from afar long takes in “real time” work – by Bacha and supervising editor Geeta Gandbhir. The only weak link is the score by gifted young Syrian composer Kareem Roustom, which is too pacific, and too ever-present – sometimes images alone can speak volumes– and feels intrusive because Bacha uses it to fill “dead space.” But Bacha’s characters – even the IDF soldiers and spokespersons – are fascinating on their own terms.